I have been using Listerine for years. I admit, though, I'm not an original Listerine fan. I was obsessed with the competitor until they phased out my favorite formulation. I had to look elsewhere for a formulation that packed a deep clean, and once you've been religiously using mouthwash everyday for years, your standards of what a deep clean feels like will reaaally go up. I wasn't 100% satisfied with the strong sting that came with using Listerine, but it was the lesser evil compared to using non-alcoholic formulations that didn't really do any help. This is why I was so happy with the release of Listerine Zero, which is a milder, no sting version. The Zero bottle I have there, though, is filled with the basic Cool Mint variant because it's the only variant sold in 1.5L bottles. I use up a 1.5L every 2 months or so, which is why I typically don't bother with the smaller bottles anymore hahaha. But weeelll, they created a new variant called Healthy White. The folks from Listerine sort of knew I was obsessed with oral hygiene, so they got me to be among the first people to try it! My thoughts are that this is the ultimate millennial mouthwash. Like I know all of us millennials are tired of being branded like we're some dog breed with all these weird quirks and quips, and I honestly hate the constant labelling, too. But this really just matches the lifestyle of the youth of today. One is that we're more coffee dependent than ever. This digital age means that we're vulnerable to being coerced or pressured into working 24/7 because there is no way to disconnect from work anymore. As a blogger, I can have people following up on outputs on weekends, weird hours, and nt everybody is nice about it. I know I am supposed to evoke this image of being a fountain of beauty spewing out fairy dust over everything I touch, but like I've mentioned plenty of times before, being a blogger is a lot of hard work. There are plenty of hours that go into it, much more than people think. Making photos look nice is soooo much harder than what people think. I only have people understand me once they, too, try to take good photos of their makeup look or their makeup. I honestly rely on so much caffeine to survive in this industry. So for the first time in this blog's history, this is our caffeine drawer at home. Yes, yes, yes. Our family has a drawer on wheels filled to the brim with tea, coffee, and all sorts of beverages. Yes, y'all should do this, too. 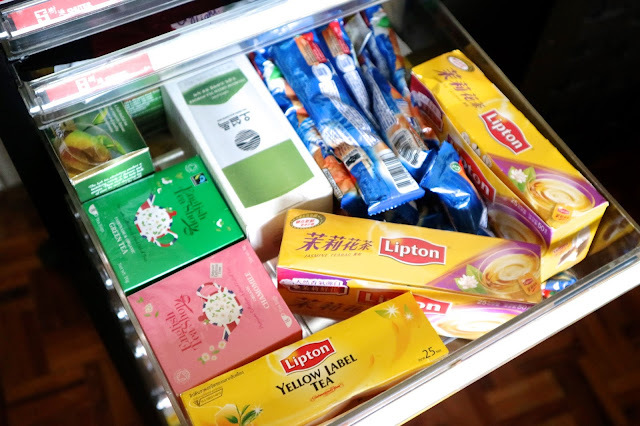 This is a summarized drawer of our teas. We have plenty of other nooks and crannies in our house with stockpiles of tea. I drink tea because I love it so much, not because I need the caffeine. Tea's caffeine barely has any effect on me anymore. But it does have an effect on my teeth as my dentist will always ask about my tea habits whenever I have a dental appointment. It's no secret I brush my teeth everyday and use mouthwash obsessively everyday, but I need a little more push when it comes to dealing with tea stains. 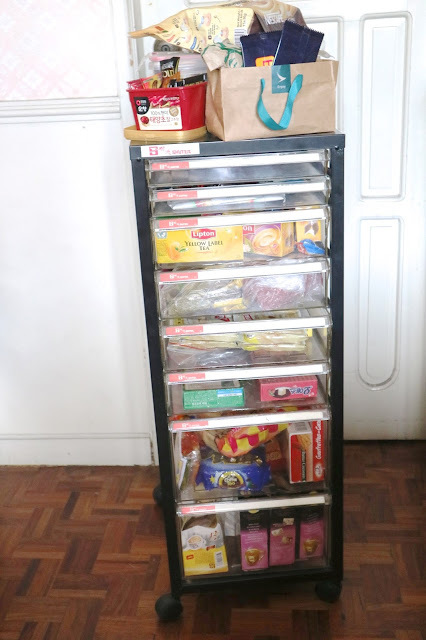 This is our supply of milk tea and some of our coffee. We have so many other brands of coffee in our home, from Folgers, UCC, illy, and the list goes on. My blood type is tea, but I take a lot of coffee, too, to feel productive. And honestly, it was in coffee that I saw how powerful this new mouthwash is. I had just come from a business endeavor in Makati and I came home with a cup of Starbucks coffee. The coffee, as expected, is strong and bold. And as expected with all kinds of coffee, it leaves the drinker with bad breath. My typical action, of course, is to use mouthwash to combat this. I then try the new Listerine Healthy White to see what happens. I won't lie that I had this "Bleh" feeling towards the taste when I first tried using it. Lemon and Salt sounds OK in theory, but in mouthwash format, there is this weird twang to it. I can't explain, but there is this peculiarity that one will need to get used to on the first use. After a few seconds of washing, the taste wasn't bothering me anymore. When I spat it out, I didn't think much of it, but about 15 minutes later, I was so impressed because it got rid of all the aftertaste of coffee, and I felt that it had neutralized all the bold and acidic flavors of the coffee. Like there was no trace of the coffee coming back. I also noticed that my taste buds were not desensitized like the usual, like I could eat other foods as usual without having to wait for a period of time for the flavor and the cool sensation of the mouthwash to die down. I felt that it is so apt for the people of this generation, or for anybody who takes coffee in general. Among all the Listerine variants I've tried (Zero, Cool Mint, Fresh Burst, Total Care), this does the best job in getting rid of the aftertaste of coffee. I feel like other variants have strong minty flavors to mask the aftertaste of coffee. This, on the other hand, neutralizes it altogether. The second main thing I noticed is that there's no sting, but for some reason, your mouth will feel clean enough after. I feel like when I use an alcohol free mouthwash that the job is not enough, but for this one, it miraculously doesn't make me feel anxious. The third thing I noticed is that this doesn't leave an overwhelming aftertaste. Whenever I use mouthwash, I find myself unable to fully taste certain foods because of how minty the mouthwash is. This is not very minty and the flavor is not overwhelming either, so you will find yourself being able to eat as usual right after using mouthwash. I think this is such an industry disrupting product because it can do what all its predecessors in the brand could not do all at the same time. It get rids of strong odors, packs a deep clean, and is not overwhelming all at the same time. This is even more important today given how much food exploration has grown in recent years. The BSP's low interest rates stimulate economic activities so much that what it means in the bottomline is that almost every week, there is something new to try. From desserts to exotic dishes, there is somehow something popping up in the Metro every week. I see Michelin star after Michelin star fill up the mall spaces. I just wish that they'd churn this out in bigger sizes soon! I need this variant in 1.5L bottles!!! Personally I am a fan of the Listerine Cool Mint or either the Orahex as sorethroat has been my bestfriend. 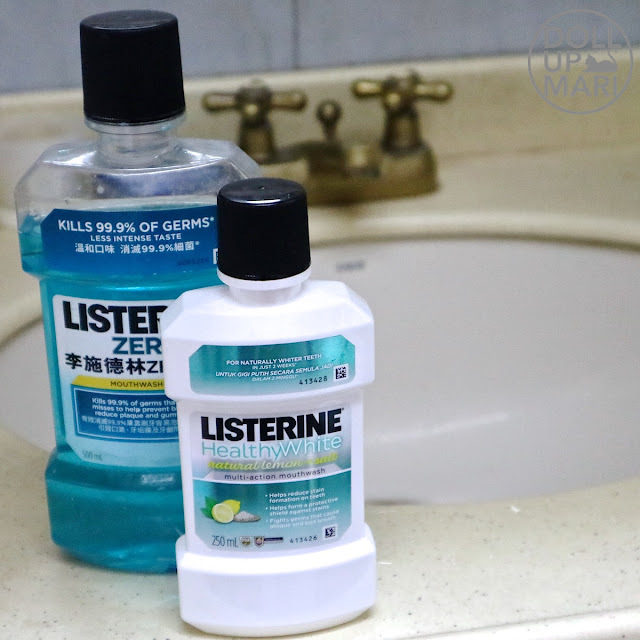 A clean and refreshing feeling is what I feel after using Listerine mint flavor so it has been my mouthwash for everyday use. I got a little curious seeing in your post that there is a new variant to Listerine which focuses on reducing stain formation. I myself loves to eat so I need something to clean up my yellowish teeth with a toothpaste and it needs a friend to help the job become easier, a mouthwash. I am excited to try this Healthy white natural lemon & salt variant once my last bottle of Listerine goes out. I love listerine! I can't end a day without using it, di naman p sa maarte ako ah, I just really feel needed ko yan gamitin everyday kasi feeling ko kapag tootbrush lng di enough eh, feeling ko di malinis bibig ko..nakasanayan ko na rin po tlga eh, listerine user ako for almost 4 years...once a day po tlga ang gamit ko nyan..maganda po yan ah, d ko pa yan nagamit new flavor nila..gotta try that!